Biodigesters, which turn food and other organic waste into renewable energy, are being used safely and effectively in thousands of communities and neighborhoods around the globe. In some countries, it’s common for apartment buildings to have their own biodigesters. In the United States, businesses, universities and communities are increasingly turning to biodigesters to limit the amount of food waste sent to landfills. Ideally, biodigesters are located close to the source of food waste – reducing truck traffic and other impacts. Louisville’s Own Backyard – In the Louisville area, several biodigesters have so little impact on neighbors that they’ve received almost no attention. The ConAgra biodigester in Oldham County is located next door to the local YMCA and a residential neighborhood. In West Louisville, a biodigester at the Morris Forman Water Quality Treatment Center produces some of the energy needed to run the facility. 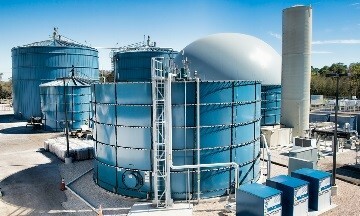 Walt Disney World – Just a mile from Walt Disney World in Orlando, a biodigester collects energy from the food waste left by Disney’s 17 million annual visitors: http://www.theguardian.com/sustainable-business/2014/oct/17/disney-world-biogas-food-waste-energy-clean-tech. The University of California-Davis – A campus with 26,000 students has one of the largest biodigesters on a U.S. college campus, converting 50 tons of waste into 12,000 kWh of renewable electricity: http://bae.engineering.ucdavis.edu/blog/uc-davis-biodigester-power-campus-january/. Concord Hilton in the San Francisco Bay Area – A 320-room luxury hotel at the gateway to Wine Country has a working biodigester in its kitchen: http://news.hilton.com/index.cfm/news/governor-brown-awards-hilton-concord-2013-top-environmental-leadership-geela-award?tl=fr. 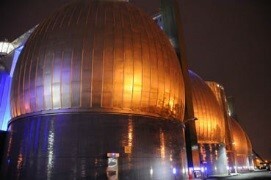 Brooklyn neighborhood – Artistically-lit, egg-shaped biodigesters are located in a densely populated New York neighborhood. They have become local landmarks while recycling waste water, reducing food waste and producing clean energy: http://www.npr.org/sections/thesalt/2014/03/11/287310897/turning-food-waste-into-fuel-takes-gumption-and-trillions-of-bacteria. Click here to see a list of projects profiles from across the country.